My last day at geek mecca. However, this isn’t the end of my Comic-Con blog posts, because I have lots of stuff to fill in. 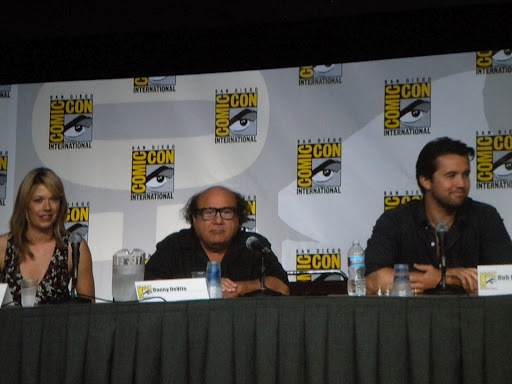 The cast of It’s Always Sunny in Philadelphia unveiled their premiere for next season. It’s entitled, “Who got Dee pregnant?” and needless to say, it’s hilarious. Kaitlin Olson, the actress who plays Sweet Dee, actually showed up to Comic-Con with a bun in the oven. The main characters also had Cricket on stage with them and assured us that the gang is not through torturing poor Cricket. 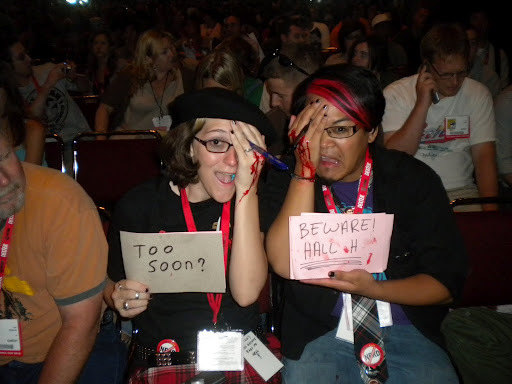 This was one of the highlights of my day– these two girls “dressed up” like Hall H victims. In case you haven’t heard, on Saturday, two guys got into a scuffle over a seat in Hall H and one guy stabbed the other in the eye with a pen. I was there, and I can tell you, the seat wasn’t even good. The final hurrah of Comic-Con was the screening of the Buffy episode “Once More With Feeling,” which is a sing-along with a Rocky Horror vibe to it. I yelled “Shut up, Dawn!” so many times that I lost my voice. We also yelled, “Bite me!” whenever Spike appeared on screen and “Liar!” when Buffy tells Spike she’s never going to be with him and when Xander tells Anya he’ll never leave her. If that wasn’t enough fun, we were given clever traffic tickets (which I’ll post later) and little monster finger puppets (so we could say, “Grrr! Arrrgh!” during the closing credits). I heart Buffy. I am uber jealous you got to go to the sing along. HOW COME WE'VE NEVER SHARED OUR MUTUAL LOVE OF ALL THINGS NERD?I'm upset that we haven't bonded over this. We need to be better friends.